Training control and awareness in children can often be helped with an external stimulus. Start with the child on hands and knees, with hands under shoulders and knees under hips. Pretend that the back is a table – strong and flat. 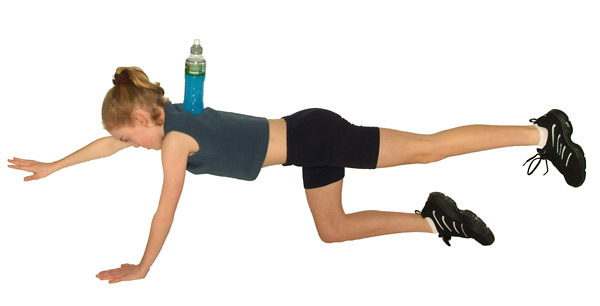 Balance an object between the child’s shoulder blades – a small water bottle is quite good for this. Remember though, that the taller the bottle is, the harder this will become, so to keep the child motivated, start with a shorter option. The child stretches one heel straight out behind them, and reaches the opposite arm out in front of them, while attempting to keep the object on their back from tipping over. The water bottle acts as a feedback mechanism, stimulating the child to maintain a level back with trunk control, and strong, stable hips and shoulders.